In the same vein I suppose that glitches in that sort of technology show that after all it is technology and not magic. 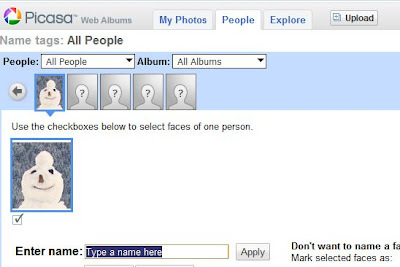 If you can fool birds into believing a scare crow is a man, what can you make Picasa believe? I had the photo below in my web album, from last winter when me, my brother, our wives and their children build the best igloo ever in Switzerland. The wind had picked up ice blocks from the Sihl See and put them all in one corner - excellent building material. With the left over material we build a snow man, because, well snow men is what you build in the Netherlands if there is snow. Picasa Webalbums liked our snow man. Enough to offer it under the section of clearly recognized faces. Unfortunately I don't have a matching contact and fear the man has deceased since.